Aurélie Fontan is a sustainable fashion designer focused on biodesign and ethical manufacture processes. Her graduate collection Tensegrity demonstrates the positive combination of craft and technology, essentially based on science imagery and disciplines. One of her pieces is entirely grown from kombucha. 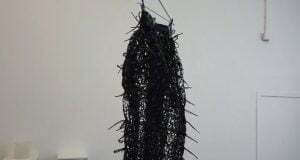 She has been working at the Ascus Art & Science Lab for two years, researching and practicing biodesign with slime mould and kombucha, applied to fashion artefacts. Aurélie is a recipient of numerous awards: Dame Vivienne Westwood Sustainable and Ethical Award, Catwalk Textiles, M&S Womenswear Award at Graduate Fashion Week 2018 and an Honorary Mention for the kombucha dress at Reshape Competition in Barcelona.